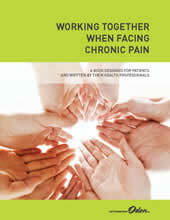 Working Together When Facing Chronic Pain has just been published. This book is designed for patients and written by their health professionals. I’ve contributed to several of the chapters. The book is available through Amazon. Working Together When Facing Chronic Pain is above all intended to give people suffering from any form of chronic pain food for thought and information about a large number of tools and treatments, as well as about the physiological, psychological and social aspects of pain. The loved ones of an individual suffering from chronic pain may also benefit significantly from this book since it will enable them to persevere in the search for short-, medium- and long-term solutions, in order to return to a more active, even a normal life. This work is also intended for all health professionals who want to learn more about the issues and aspects specific to chronic pain, and benefit from the experience of their colleagues and the testimonials of patients. The book is available en francais also. Disclosure: A small percentage of profits from the book will be divided among all authors, after expenses. Any payments I receive are donated to charity.